Bread is part and parcel of the our lives. It is a staple for many as its versatility allows one to have it for practically all meals of the day, be it breakfast or supper. Its portability allows one to have it as a meal-on-the-go, be it on the bus or while waiting for it. Here’s a no-frills bread recipe which I’d been using for sometime now. I seldom make bread because I simply don’t have the patience for it. The multitude of waiting times as the bread goes through repeated proofing as well as time for the dough to rest. But once a while when a recipe calls for bread or when I’m in the mood, I’ll just get my Pullman tin out to make a simple loaf. It is incredibly easy to make with very reproducible results! The recipe comes from Carol 胡涓涓’s “The Second Book of Baking for Beginners” 烘焙新手必备的第二本书. Carol Hu is one of the more prolific new generation of cookbook authors in Taiwan. She has currently two books under the “Baking for Beginners” series, together with a couple more on noodles, ice-cream and simple daily meals. The “Baking for Beginners” series is a good reference for anyone who’s venturing into baking for the first time. In Taiwan, we see a trend of big screen celebrities and TV personalities starting to put on the apron, get into the kitchen and churn out cookbooks. I often wonder given their busy filming and publicity schedules, how many of these “stars” actually cook or bake on a regular basis. Truth be told, I generally avoid cookbooks by such folks, but instead support authors like Carol and 孟老师 who specialise and has done lots the research and promotion of the culinary arts to the everyday folk like us. Their recipes are reliable and reproducible for anyone with some baking skills at hand, or are willing to learn and pick up. The milk loaf recipe in Carol’s book is by the direct method. So yes, it would not yield results for super duper soft breads like those which would be produced by some other methods, say 汤种 water roux method. But I like it precisely because it is simple and easy to follow. The ingredient list is short and already in my mind, having made it a couple of times before. I’d used it to make one of Penang’s signature snacks Nyonya Roti Babi last year. Just that I didn’t do it justice to feature the recipe together with the Roti Babi then. For me, it is also a “naked canvas recipe” allowing me to play around with the ingredients within acceptable range to produce a large variety of breads. One can easy swop the regular white sugar with brown sugar or even honey and maple syrup. Otherwise, the milk component can also be changed, by using flavoured milks like chocolate or banana, or simply milk powder instead with the same amount of liquids but in the form of beetroot juice or carrot juice. Also, “filling” can be added in the form of chocolate chips, nuts, raisins etc. As Picasso has famously said, “Everything you can imagine is real.” So the versatility of a white loaf bread recipe like this really stretches the possibilities. 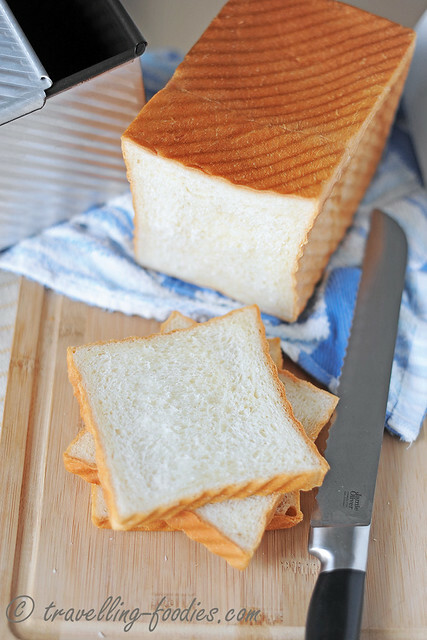 The making of this particular loaf comes with a purpose, as it is used for a very popular snack 官财板 Coffin Toast in southern Taiwan which I am making for AFF Taiwan. So do keep a look out for it! Mix at low speed (speed 1) until all the ingredients are well mixed to form a coarse ball dough ( appro. 2-3 min). Add the remaining liquids if necessary and stop when the dough formed is of the same softness as one’s ear lobes. Add butter and slowly increase the speed to medium high (speed 4) for appro. 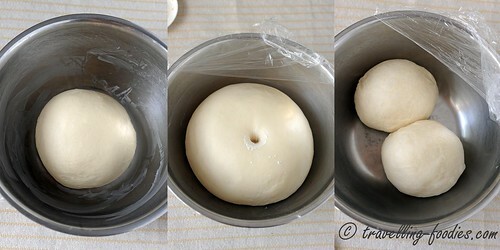 15-18 min until a smooth, non-sticky dough is formed. Shape the dough into a ball and allow it to proof for 1 hour in a bowl lightly greased with butter and covered with cling film until it doubles in size. Test the readiness of the dough with a finger lightly dusted with low-gluten or cake flour. If the dough is ready if the dough remains indented after the finger pokes into it. Divide the dough into two equal portions and leave to rest in the same proofing bowl for another 15 min. 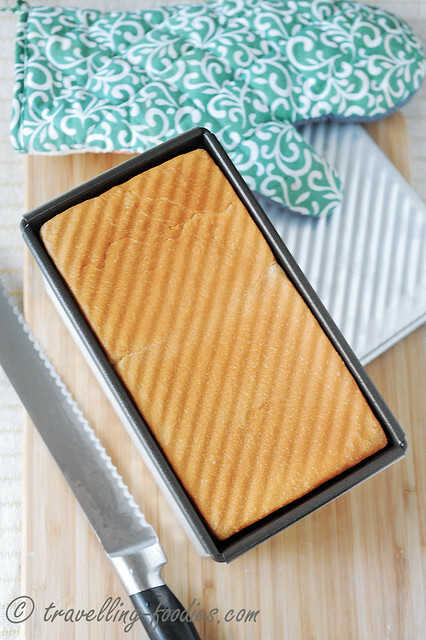 Place a piece of cut dough onto a board lightly dusted with low-gluten or cake flour. 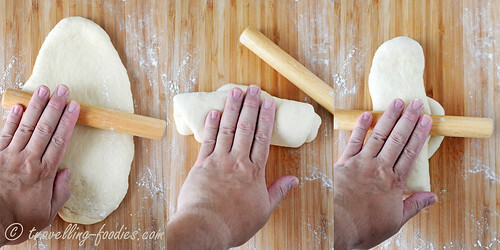 Roll out the dough lengthwise, pressing the rolling pin down with some force to expel as much air out of the dough as possible. This minimises the formation of large air pockets in the baked bread. Roll the flattened piece of dough like a Swiss roll. Rotate the rolled dough 90° with one of the ends facing you, and proceed to roll it out again lengthwise to flatten and elongate it. Roll the flattened piece of dough like a Swiss roll again and place it in a Pullman baking tin which has been lightly greased with butter. 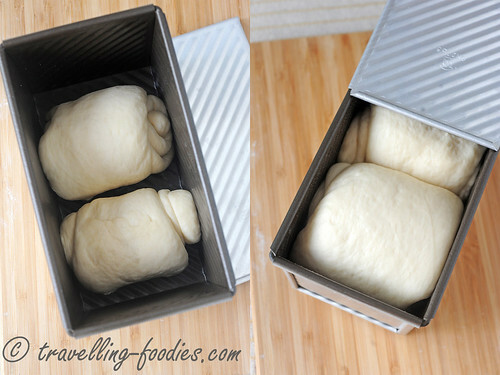 Repeat the procedure with the second piece of cut dough and place it in the baking tin, leaving a small gap between the two dough pieces to allow space for them to expand and rise as they proof the second time. Spray some water over the dough with a fine-mist nozzle. Proof the final bread dough in the tin for 50 min until it almost reaches the brim of the tin. Place the tin in the preheated oven and bake for 40 min. Once the bread is baked, quickly remove it from the tin and cool on a rack. The cooled down bread can be placed back into the tin after cooling completely until it is ready to be sliced. NOTE: the speeds provided are for the Kenwood Titanium Chef KM10 I am using for the kneading process. Please adjust the kneading speeds in accordance to your own stand mixer or bread machine. It is important to expel as much air pockets of carbon dioxide formed from the first proofing as possible. Accumulation of remnant air pockets from the first proofing will affect the second proofing and the stability of the bread dough during baking. Large air pockets in the dough can cause the dough to stretch too much during the initial baking process, before the bread structure stabilises and takes shape. When the bread cools, these air pockets shrink causing the bread to “collapse” and lose shape. This entry was posted on August 8, 2014 by Alan (travellingfoodies). 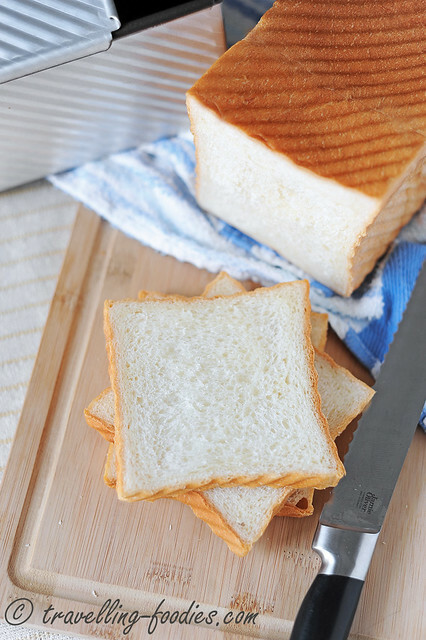 It was filed under Food, Simple Eats and was tagged with coffin toast, 简易牛奶白土司麵包, 面包, loaf bread, Roti Babi, Simple White Milk Loaf Bread, 吐司, 官财板, 棺材板. I like carol 老师’s bake books. I didnt get the one on bread. I think i will get one soon. Loaf turned out lovely thou I forgot to add an egg. Definitely a keeper ! Thanks for sharing this. Thank you for the recipe… i try it last nite and left it in the fridge for 1st proofing. This morning took it out, at room temp, roll and place in loaf tin for 2nd proofing…. love the texture of the bread- very nice. Hi, thanks for sharing this recipe. Would like to check with you on the texture and colour of this bread. Unlike your bread colour, mine turns out yellowish. The texture though soft is abit on the chewy side. Did I do some steps wrongly? Would appreciate your advice. Tq. Hi Alan, Thanks for the quick reply. Will take note of the pointers. Hi Alan, I was wondering for the butter, do you melt it first or just add it regularly?